One-page dinner menu for the Steuben Hof, a German American restaurant, on a form menu with a roundel illustration of three men raising their tankards in a toast at a table near a window and typewritten menu items, including Vienna schnitzel, bauernwurst with sauerkraut, and sauerbraten with potato dumplings. Two cans advertise "Pabst TapaCan" beer at the bottom. 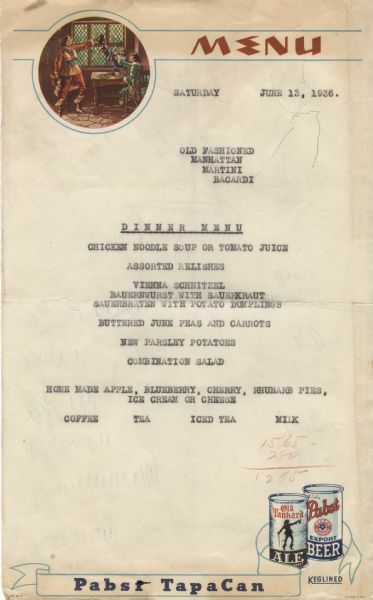 See also Image ID: 120845 for a Steuben Hof lunch menu.